At work, 70, sunny, windy…felt very good and strong, listen to music instead of a book. Ran to Goodale Park and back. Left foot hurt after I started walking at mile 3, but it didn’t last long. No running tomorrow. I am gonna miss it! Approx 22 1/2 min…nice weather! Wanted to run 3, but after two the middle toe on my left foot hurt everytime I struck the ground, so I walked back. I was able to run a little bit without pain, that was after walking for about 5 min. The pictures are finally in at Runphotos.com. No Garmin, no time, but according to my iPod I ran about 20 min, and going by previous distances covered I ran about 2 miles, not bad not bad. The weather was beautiful, sunny a litte wind. I tried streching my IT band afterwards, but the streches shown in the magazines/books don’t seem to work for me! I don’t think I’ll be running over the weekend unless I get an urge. 40 min, approx 487 calories and over 4 miles on the eliptical rider. The Peal Izumi felt a little tight, but that could be because of way you have to move on the machine. I went to Front Runner in Columbus to get a new pair of shoes. My old ones are very worn and way past the ‘throw away date’. I knew they would be examining my feet, well the way I walk and stand, etc., so I put my running socks on and sandals. I also brought my old pair with me, so he could look at the wear pattern on the bottom to make sure I am getting the right shoe (stability vs motion control or cushioning). I have a normal ‘pronation’ (meaning my foot strikes and leaves the ground the way it is suppose to), which means I am looking for a stability shoe. 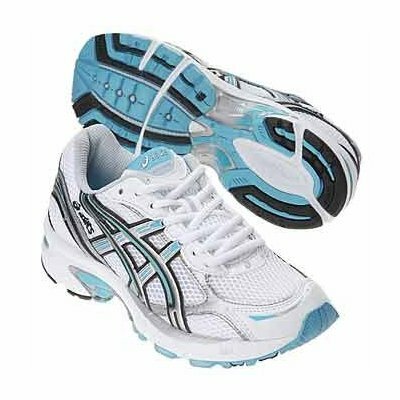 My previous pair was an Asics Gel-1100 and it has worked well for me, so he brought out the Asics Gel-1120. Different color, but fit like a glove. 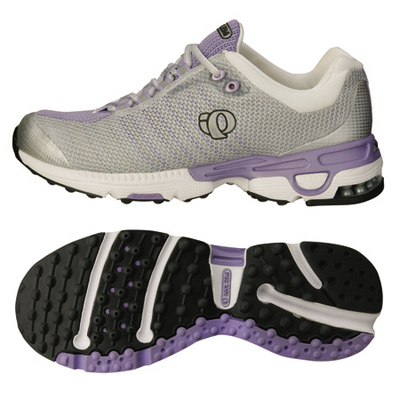 He also brought out the Pearl Izumi synchoSPACE, now there is a fancy looking shoe. All I saw was purple when looking down at it, but the sides are silver, and it fit really well and felt sooo light. So, I decided, being that I like the way the Asics look/feel and the Pearl Izumi feel I bought both.